One of my very first blog posts was about the link between big government and big corruption. For the rest of my life, I can now cite the Obamacare travesty as an example. Here’s some of what Tim Carney wrote for the Washington Examiner. Chief Justice John Roberts’ judicial sleight of hand, transforming Obamacare’s mandate into a tax, was a fittingly twisted save for a law of such grisly provenance. 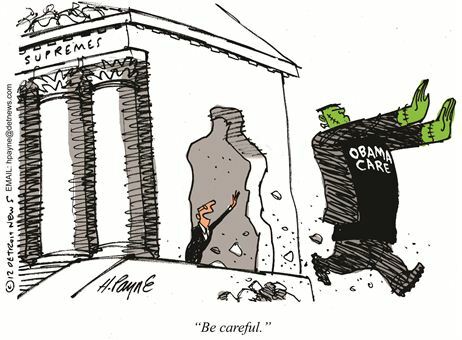 Born of tawdry liaisons between industry lobbyists and political hacks, passed through naked logrolling and legislative skullduggery, Obamacare wasn’t finalized until Thursday, when the chief justice, in effect, amended the bill so that it would become constitutional. Tim recounts some of the sleaze and corruption that allowed Obamacare to move through Congress. …within weeks of his inauguration, Obama started playing the game. An early Obamacare confab was held at the headquarters of the Democratic Senatorial Campaign Committee — showing how this was a political exercise as much as a policy one. At this April 2009 meeting, top lobbyists from the drug industry and White House Deputy Chief of Staff Jim Messina hammered out a deal — exposed by recently released emails — whereby the drug industry would pay for pro-Obamacare ads basically written by the White House. Big Pharma would also spend big to re-elect Democrats who voted for the bill. …The Senate bill was authored mostly by Finance Committee Chairman Max Baucus and Majority Leader Harry Reid, probably the two senators most notoriously cozy with lobbyists. To win over wavering Democrats, Reid loaded the bill up with special favors. Nebraska’s Ben Nelson got the “Cornhusker Kickback,” and Reid bought Mary Landrieu’s vote with the “Louisiana Purchase” — both deals giving those states extra Medicaid money. … Democratic staffers who wrote the bill cashed out to K Street nearly immediately, becoming health industry lobbyists. Democratic Reps. Bart Stupak and Earl Pomeroy, who both lost their seats (Stupak retired, Pomeroy was defeated) thanks to their votes for Obamacare, were also rewarded with lobbying gigs for health care companies. The combination of a politically motivated Chief Justice and a tawdry legislative process led Tim to this conclusion. If this is how a bill becomes a law, our kids are going to need new civics textbooks. Since this is a very depressing topic, we need to add some levity. I already did a post with several good Obamacare cartoons, but I can’t resist adding this one. Returning to our unpleasant topic, Richard Epstein opined last Friday in the New York Times about the Obamacare decision and explained (as I noted last week as well) that the power to tax does not create a power to spend. By giving Congress independent powers over taxation and other revenue sources, the Constitution ended that dependency. But as a quid pro quo, the Constitution also restricted the use of these revenues to classical public goods — benefits that must be given to all citizens, if given to any — like paying off national debts and paying for the nation’s defense. General welfare, mentioned in parallel with these two phrases, is best read as covering only matters that advance the welfare of the United States as a whole. The redistribution of income, or “transfer payments” among citizens, like those mandated under the Affordable Care Act, doesn’t qualify for taxation in this originalist reading of the Constitution. Through the early 20th century, the Supreme Court was cognizant of this tight relationship between the power to regulate an activity directly and to the power to tax it. The basic idea relies on a simple economic insight: taxation and regulation are close substitutes, so a limitation on one power matters little if the other power is still available. There is no practical difference between ordering an action, and taxing or fining people who don’t do that same thing. If the Constitution limits direct federal powers, it must also limit Congress’s indirect power of taxation. Unfortunately, Supreme Court Justices sometimes don’t care what the Constitution says. P.S. This is the second time the Obamacare Frankenstein monster has appeared on this blog. He was with his twin brother last time. P.P.S. This is a post about the unseemly genesis of Obamacare, but I’m a fiscal policy wonk, so I want to remind everyone that this new entitlement will be a budget buster. Reblogged this on Talon's Point. It’s always good to remember, legislation does not necessarily equal law. Also remember, the townspeople took matters into their own hands when Frankenstein’s monster got loose. I’m interested to see what the ‘compassionate’ folks who do not want poor people to be denied health care will do when the government tries to collect $2k from them for not buying health insurance. It doesn’t seem like they’ve connected these dots yet. I imagine when this happens the legislation will lose its teeth. Perhaps charity will suddenly look like a better option to them. Finally, the only thing I don’t like about the cartoon is that F’s monster wasn’t such a bad dude, just a little clumsy. If I were to redo the cartoon, perhaps dripping water on the gremlins would be a better picture. I’m sure this is another well thought out post, but I don’t want to think about it right now. I do want to say this headline is this years best, so far. It will be a “growth buster” and thaLlosa all that matters for mid and long term prosperity. Growth buster because even though Americans have not quite descended to French incentives to produce, the point of no return has passed on America’s trajectory to decline. Now, as the growth we have complacently been accustomed to becomes unattainable we will feel the economic distress. Predictably we will head to the polls for some relief in the form of more government “care” packages. The point of no return has passed. Enjoy a few years of decline while reality and the awakening three billion people of the emerging world sort things out. All that really matters is what happens in November!! !